On Tuesday evening, CNN tried to put the best spin on Senator Byron Dorgan's announcement that he wasn't running for reelection, labeling the pro-abortion, union-friendly liberal who was trailing in the polls a "moderate Democrat....[who] was expected to easily win a fourth term." As Mike Bates reported on NewsBusters on Wednesday morning, anchor Wolf Blitzer gave a news brief on Byron's decision 50 minutes into the 6 pm Eastern hour, describing the North Dakota senator as a "moderate Democrat." Just over an hour later, Campbell Brown gave another brief on the politician's retirement during the first minutes of her program, stating that "Dorgan was expected to easily win a fourth term." 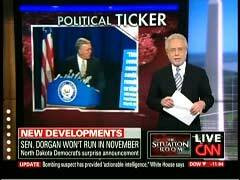 Despite the CNN anchors' claims to the contrary, Senator Dorgan was neither a "moderate" nor was he "expected to easily win a fourth term." Bates pointed out that the Democrat received a 100 percent rating in 2008 from NARAL Pro-Choice America, a 100 percent the same year from AFL-CIO, and a grade of A from the National Education Association during the 2007-2008 period. Dorgan also received negative marks from conservative organizations. The American Conservative Union gave him an 8 percent rating for 2008, and the National Taxpayers Union gave him a grade of D (these interest group's ratings were compiled by Project Vote Smart). The outgoing North Dakota senator also was facing a tough reelection fight if he had stayed in the race. Bates cited a December 22, 2009 report by the Bismark Tribune, which noted that Dorgan was trailing Republican Governor John Hoeven, according to a poll conducted by Rasmussen Reports. Hoeven led by 22 points- 58% to 36%, with only 6% undecided. An earlier poll by Zogby had similar results. The Zogby poll also found strong opposition to President Obama's health care "reform" push, a cause supported by Senator Dorgan. North Dakota's Democratic senator, Byron Dorgan, just announced he won't run for reelection to the U.S. Senate in November. The surprise announcement could give Republicans a chance to pick up a Senate seat in that red state. Dorgan was first elected to the Senate back in 1992 after serving a dozen years in the House. The moderate Democrat says he wants to pursue other interests. On the political front, a big blow to Democrats' hopes of keeping control of the Senate. North Dakota Senator Byron Dorgan announced today he won't run for reelection this year, a big surprise here. Dorgan was expected to easily win a fourth term, so a boost for Republicans there. Leave it to CNN to cast the demise of a liberal's political career in the best light.